Don't spend too much shipping packages -- check these tips first. It’s that time of year again, when the lines are long and often wind around out the door and the building. We’re not talking about the queue to meet Santa – it’s the line to ship out the holiday gifts you’ve bought for friends and family who you won’t see in person. The only thing worse than having to wait in an hour-long line before you get to the shipping counter is to see the often alarming price you’ll pay to send your parcels to the gift recipients. Fortunately, there are ways to prepare for the costs you’ll face long before you walk into the shipping location. By doing your research ahead of time, you can make smart and informed decisions about how much you can expect to spend and pinpoint the best rates from a variety of carriers. If you’re a frequent shipper, you know that shipping charges can change dramatically between carriers depending on the sizes and dimensions of your package and how soon you need them to arrive at the destination. These factors can be the differentiators between shipping a box for $5 and $50. Sometimes you can find a general rule, such as the fact that in many cases, shipping a small package will often be cheaper via the US Postal Service (USPS) than it would be when shipping from FedEx or UPS. The opposite tends to be true for larger or heavier packages. For instance, we checked the cost of shipping a 1.5-pound package with the dimensions of five inches by six inches (height of two inches) from Chicago to New York with a two to three-day delivery window. The USPS Priority Mail cost was $9.85, FedEx Ground was $10.56 and UPS Ground was $11.43, making USPS the winner for this small package. However, a 15-pound package with the dimensions of 15 by 10 (four-inch height) from Chicago to New York with the same delivery window shows that UPS and FedEx cost less than the Postal Service. In this case, UPS Ground costs $21.58, FedEx costs $26.88 and USPS costs $35.65, making UPS Ground the winner. To calculate the best cost for your package, you’re probably imagining yourself running around town lugging your package in and out of the Post Office, the FedEx shop and the UPS Store. But that’s not necessary – in fact, you don’t even need to leave your house to calculate the costs, as long as you have a way to measure and weigh the package. Then, you can go online to calculate the cost of shipping your package. You’ll enter the originating address, the address where you’re shipping the package, the dimensions, and the weight, as well as information on when you want the package to arrive. You can visit the individual shippers’ websites, or you can go to a central site that calculates that information for you. For example, OnlineShippingCalculator.com can show you the costs for each shipping method based on the distance, weight, and dimensions of the package. However, this site assumes that you have an online shipping account. Many consumers don’t necessarily have those — these are more common for small and large businesses. The site will give you a good ballpark of the least and most expensive shipping methods, but the price itself may be slightly off when compared to taking your package to a store. You can also try sites and apps such as ParcelMonkey and ShipGooder, which will allow you to figure out what you’ll spend on shipping each package. Some of these platforms allow you to print out the shipping label and schedule pickup right from your front door, offering both savings and convenience. Do Shippers Use Surge Pricing? You may think you’ll spend more when shipping items over the holidays because the shipping companies are so busy, but surge pricing is not as common in the residential shipping industry as it is with ride-share cars like Uber. 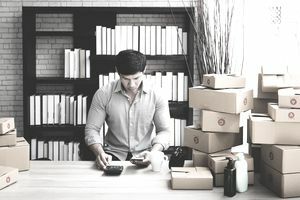 Although some shipping companies do increase prices for some of their larger customers (such as big retailers) over busy shipping periods, those charges are not typically passed along to “regular” people. You are not likely to notice any significant changes in your shipping costs around busy shipping periods such as Christmas or Mother’s Day. To save more when shipping, you should always save shipping materials from packages that you receive. If you get a package, always save the box and the packaging support materials (such as bubbles and peanuts) so you can use them when you need to ship something. In addition, look for sales on packing tape so you don't have to spend full price on it.